What a splendid day the Marple Lime Kilns Discovery Day turned out to be. After a week of rain the sun shone brightly all day. The opportunity to learn about the Lime Kilns' history and architecture, and to catch glimpses of the pad stones which supported the rails of the tramway system, attracted visitors all day long. information stands, video screens and research material on display at the Forces Club. This is the first public event at the Lime Kilns as part of the Heritage Lottery Funded 'Revealing Oldknow's Legacy' 3 year project. The project, which is run by the Mellor Archaeological Trust and Canal and River Trust, covers three sites from the Industrial Revolution and tells the story of Samuel Oldknow, the industrial entrepeneur, responsible for so much of the Marple we see today. The civic society worked in partnership with the project to deliver the Lime Kilns Discovery Day. A further project is planned in October this year; one of 3 consecutive annual community events to uncover more archaeological evidence at the Lime Kilns site and discover more of its history. The October event is likely to be a community dig following the tramway across Oldknow's recreation ground. The society's May 2015 Newsletter is now available. Asda has withdrawn their first signage planning application, dealt with some of the signage problems and resubmitted the application. The civic society is pleased that this scheme has been rethought and its impact reduced. There are several controversial signs that will be the subject of a separate application, including the long green facia board along the frontage and around the gable end facing Hollins Lane. 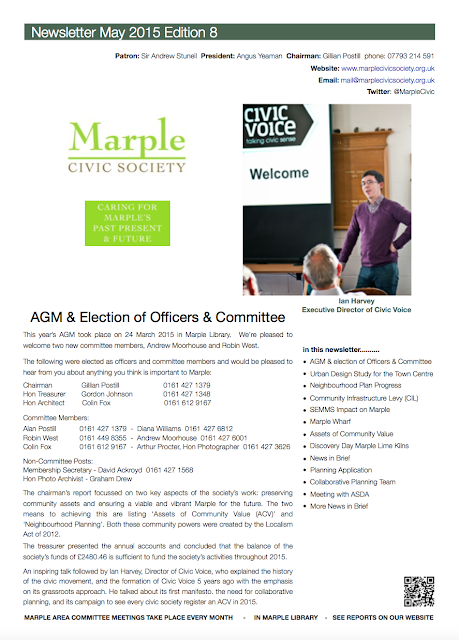 The Society's next speaker meeting will take place from 4.00pm - 5.00pm on Tuesday 19th May in Marple Library - there is a lift available. 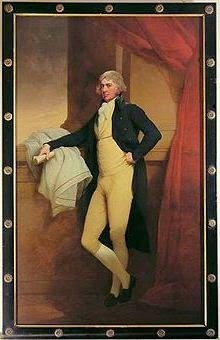 The talk will take us back in time as Samuel Oldknow, dressed for the occasion, tells the story of his life in Marple and beyond. Bob Humphrey-Taylor continues the talk with the latest updates and finds at the Mellor Mill archaeological site and says he should have some groundbreaking news to tell!! As part of the "Revealing Oldknow's Legacy (ROL)" Heritage Lottery Funded project a Lime Kiln Discovery Day has been arranged on Saturday 23rd May 2015. It promises to be a great day out for all the family. Come and join us to discover more about the Lime Kilns and their place in Marple's history . monument and get details of a community dig planned for later in the year. Free tours are planned every half hour from 11.00am until 2.30pm but it is advisable to book. There will be two family friendly tours starting at 11.30am and 2.00pm. Norman Redhead, the director of archaeology at Greater Manchester Archaeological Advisory Service will by on hand to answer questions and the desk based assessment carried out by Dr Peter Arrowsmith will be available to look at. A display stall and cold drinks will be available in the Social & Forces Club and you can be sure of a warm welcome. Further details of the event can be viewed HERE. An informal meeting was held yesterday with Alan Jones, Senior Property Communications Manager of Asda. 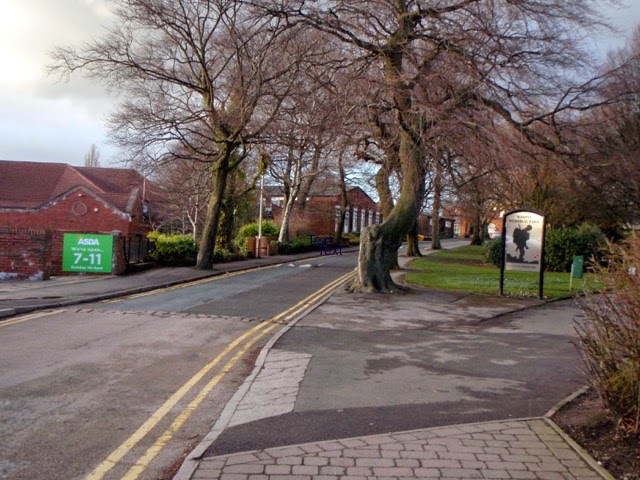 We discussed the following issues: Parking, Signage, Neighbourhood Planning and the Marple Town Centre Urban Design Study Project which started on Wednesday 13th May. As the car parking signs are not clear we agreed it would be beneficial to alter the wording which would help to clarify the parking arrangements. The last signage planning application has been withdrawn and a new application submitted. There will be a separate application for 3 of the larger signs which will require further discussion. Asda have given their support for the Urban Design Study and offered to meet with us when appropriate. The Community Infrastructure Levy (CIL) allows local authorities to raise pre-determined funds from developers undertaking new building projects in their area. CIL replaces the previous system of agreeing planning obligations between local authorities and developers (known as section106 agreements) and gives local authorities the freedom to determine how this money should be spent. Under CIL local authorities will be required to pass on 25% of the money raised from new development within a Neighbourhood Plan area to the community itself. The community can then decide how the money is spent. Communities that do not have a Neighbourhood Plan will receive 15% of CIL. The Civic Society supports the implementation of the Community Infrastructure Levy. Following our objection to the Asda planning application for signage we understand that a meeting has taken place between Stockport MBC planners and Asda. Asda have agreed to withdraw their application and have taken down the offensive sign at the entrance to the Memorial Park. However, as far as we know, they have not yet withdrawn their planning application. Council Planning officers and Asda have promised to arrange a meeting in early May to which the Civic Society will be invited.